Who ya gonna call? Ghostbusters! But where ya gonna call them? At their iconic firehouse headquarters, of course. In the film, the spook chasers’ firehouse is as much of an iconic piece of the action as the Ecto-1 car or their homemade proton packs. It appears in Ghostbusters video games and even has its own LEGO set. But in reality the firehouse has a history that is more Old New York than supernatural hot spot. 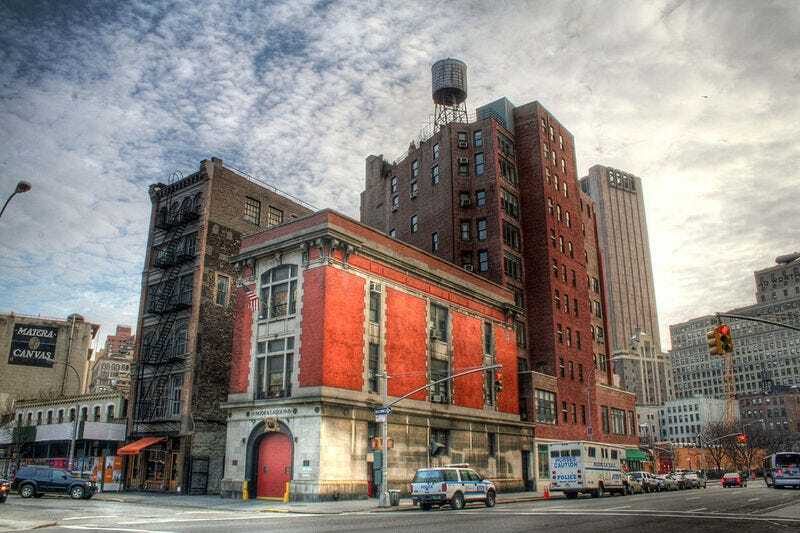 Hook and Ladder 8, the building used for the exterior shots of the Ghostbusters’ HQ, is a working firehouse that has been around for more than a century. In fact, the firehouse even pre-dates the Fire Department of New York. When Hook and Ladder 8 was established, the firefighting forces of New York were made up of a bunch of loosely affiliated companies of volunteering men. In 1866, just one year after these disparate fire brigades were incorporated under the umbrella of the Metropolitan Fire Department, the Hook and Ladder 8 company moved its operations to the current spot on North Moore Street in Tribeca. At the time, an older school building occupied the site. It was not until the 1898 unification of the five New York City boroughs that the Fire Department of New York as it exists today was born. With the development of this larger, more centralized force, Hook and Ladder 8 received a brand new firehouse in 1903, although it looked much different than it does today. The new building, designed by the Superintendent of Buildings at the time, Alexander H. Stevens, was one of the first firehouses of its kind. Prior to Stevens’ tenure as the Superintendent, the design and construction of New York’s firehouses was outsourced to the architectural firm of Napoleon LeBrun & Sons. But when Stevens came in, he took over the creation of new fire buildings. His signature style was Beaux-Arts, a classically tinged school of design that would inform a number of New York buildings—most famously, Grand Central Station. Stevens’ archetypal firehouse design had tall banks of windows on each floor and a central, arched portal on the ground floor that provided vehicle access. Hook and Ladder 8’s new building was one of the first buildings to show off the design, embellished with a decorative cornice above the truck entrance. When it was built, it was twice the size it is today, with two vehicle doors. The firehouse was cut down to its current dimensions in 1913, when Varick Street underwent an expansion that forced the building to downsize. For decades, the firehouse and its men protected the city as one of many reliable FDNY fire stations. Then the Ghostbusters came to town. The film, much like the firehouse itself, was much different in its initial stages. In an early version of the script, the story took place in a future world where the Ghostbusters were a municipal force like the police or, well, firefighters. In accordance with that, a firehouse was chosen for their base of operations, and Hook and Ladder 8 became forever known as Ghostbusters HQ. The logo sign used in the movie and its sequel still hangs in the station to this day. Once the excitement of the films died down a bit, it was back to business as usual for Hook and Ladder 8, which returned to being a standard (if now instantly recognizable) fire station. It would go on to be featured in the movie Hitch and an episode of Seinfeld, but these subsequent brushes with fame could not separate the firehouse’s legacy from that of Venkman, Spengler, Zeddemore, and Stantz. While a new crew of Ghostbusters is set to hit screens in 2016, it has yet to be seen whether they will use the Hook and Ladder 8 as their digs—but the 21st-century spook chasers would be hard-pressed to find a location any more indelible. This post by Eric Grundhauser originally appeared on Atlas Obscura. It has been republished with permission.